July 1, 2012 — This morning Athletes Without Limits Michael Murray competed in the Men’s T20 1500m Paralympic Trials in Indianapolis, IN. His time and achievements earned him the historic opportunity to be the first athlete with an intellectual disability to compete for Team USA at the upcoming London Games in September. Michael lives in Tennessee, where he has trained with the Nashville Illusions USATF Track Club. 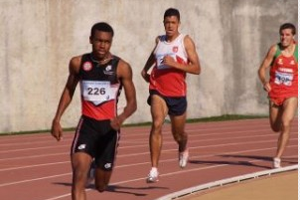 Since the twelve-year international suspension of athletes with intellectual disability in Paralympic competition was lifted for Track & Field, Swimming and Table Tennis in 2010, he has traveled to Paralympic and INAS/IPC competitions in Florida, Australia, New Zealand, Italy, Mexico and Indiana to train and race his way into a coveted spot on the US Paralympic Track and Field Team.